In your every day life, how many times do you think, “Oh, I’ll just Google it”? Probably a lot, right? Well, you’re not alone. According to the Content Marketing Institute, 93% of online experiences begin with search – meaning companies really need to be cognizant of using the latest and best practices when it comes to digital marketing and optimization. These things are absolutely critical when it comes to the success of any website. Having a strong SEO strategy is vital to surviving online in 2017, and here are some recommendations to do just that. Organic search is still the primary driver of website traffic, but we cannot ignore the role that ads play. You should know by now, but Google has been changing things up and making ads more prominent on search engine results pages. Last year, they eliminated the side rail ads and placed a heavier prominence on the four ads at the top of the page before organic search results show up. An important thing to note is that with this change, the organic search results can sometimes appear “below the fold”, which as you know in traditional marketing… is not a good thing. Changes with these types ads aren’t finished yet – so companies really need to focus on coordinating an organic and paid search-marketing plan in 2017 in order to be successful. When brands are able to answer these needs, they are able to provide the optimal mobile experience and improve their reputation. Because the customer buying journey is now made up of many touch-points, and from many different mediums, companies have to be able to adapt and have a solid plan for marketing across all channels and devices. It’s not enough anymore to have a site that’s responsive. Instead, companies should think about creating a friendlier user-experience as a whole. Not everyone in your organization may understand or be on board with focusing on your SEO strategy. It’s your job to prove to them not only why you should be doing it organically, but also why you should be spending money on it. Make sure everyone across all departments, and especially the C-level are on board – you will need buy-in from them to further your company’s organic search success in 2017. Use the numbers: Show your progress and results by starting with organic search – which is still the most important channel for most B2B and B2C websites. Because of the lower cost and potentially higher returns, it is a great place to start especially with the executives at your company, who are more likely to be thinking with costs in mind. Foster the learning of your current employees. There are so many education and training opportunities out there at pretty low costs. Do the research and invest in these opportunities – plus your employees will feel empowered in learning how to improve their role in the company. Understand your boss’ priorities. In order for you to succeed in your goals, you have to learn more about where your boss is coming from, and why. All of these factors have disrupted the way that people interact with brands and companies. Where they go for answers, and how they build relationships has changed and will continue to do so. 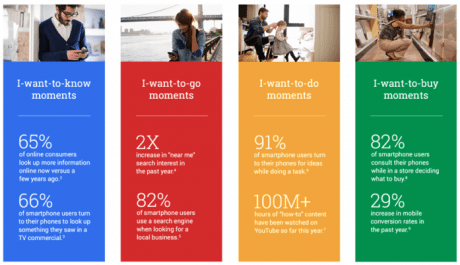 Remember that the changing customer journey due to micro-moments has a direct impact on your marketing efforts on all platforms. If you have question are interested in talking more about your company’s strategy for 2017 – we would love to set up a meeting.